This dissertation examines how adult learning of novel language structures is affected by the characteristics of the language input that learners are exposed to and by learners’ cognitive aptitudes, such as analytical ability and working memory capacity. In a series of experiments, adult native speakers of Dutch received brief auditory exposure to a miniature language based on Fijian. Within the language learners were also exposed to an agreement pattern between determiners and nouns: masculine determiner lep preceded nouns ending in –uk, and feminine determiner ris preceded nouns ending in –is (e.g., lep oseuk, ris burogis). After the exposure, learners’ knowledge of the agreement pattern and their ability to quickly predict nouns based on determiners were measured using grammaticality judgment tasks, a production task, and a processing task with eye-tracking. 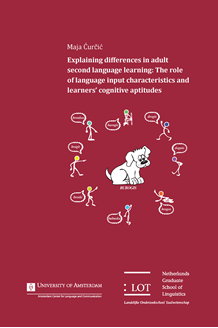 There were substantial differences between learners, both in terms of their learning success and the awareness of the underlying language patterns. The reliability of the language input (i.e., whether the agreement pattern in the input was fully regular or featured exceptions) affected learning in different ways depending on the length of the language exposure and learners’ awareness of the agreement structure. Learners’ working memory capacity and analytical abilities were positively related to their learning outcomes and to the occurrence of pattern awareness among learners. Some learners developed quick predictive processing based on determiners, but this was always accompanied by learners’ awareness that determiners were useful for making choices during the test with eye-tracking.